Today is my Dad's birthday and I still have not the faintest idea on a gift this year! It's hard getting gifts for men so I am still undecided on the best possible gift for my Dad. I would however like to wish him a very HAPPY BIRTHDAY and may he be blessed with good health and wealth always. Since I have not bought a birthday gift yet, obviously I have a lot of things to do before the birthday dinner tonight. Before I get going however, I would like to tell you about the Fat Cow. Have you heard of the Fat Cow by the way? Born in 1998, the Fat Cow is a great webhosting site I recently discovered online. With more than 10 years experience, the Fat Cow has been satisfying clients worldwide for years; ensuring complete understanding and professionalism for all your webhosting needs. 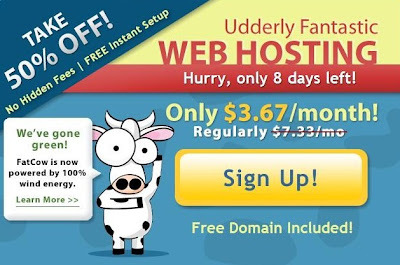 The picture basically tells you what to expect from the Fat Cow while other features include UNLIMITED Disk Space, UNLIMITED Bandwidth, UNLIMITED POP Mailboxes, UNLIMITED Domains Hosted, FREE Domain Name, FREE Website Builder and FREE Shopping Cart. Support is also available 24 hours a day and Live Chat function enables customers to easily connect to the Moo Crew. You will never be short of assistance; whenever you need it, wherever you are. I do like the sound of UNLIMITED and FREE features. Plus the Fat Cow looks really friendly so if you're looking to switch providers or planning to give paid webhosting a shot; please visit this site. Make the MOO-ve to paid webhosting with the friendly Fat Cow! Happy Birthday to my Dad and Happy Sunday to you! Happy birthday to your dad dearie.. wah how old tu? Fat cow? lol.. funny name lah.. but deal sounds awesome! :* :* :* :* And LJ Meow 3! :-D :-D :-D :-D :-D :-D :-D :-D :-D Hi BD!